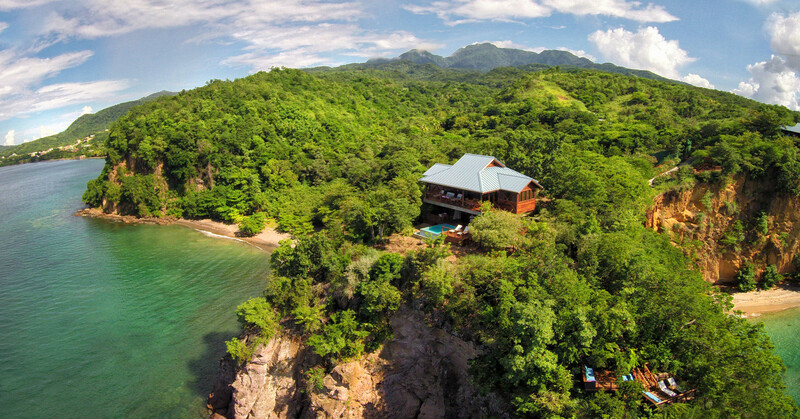 This luxury resort has just six cliffside villas overlooking the Caribbean. Secret Bay is a luxury resort in Dominica, with just eight villas and bungalows nestled on a cliff overlooking the Caribbean. Secret Bay’s luxury bungalows and villas have air conditioning, free Wi-Fi, a private bathroom, kitchen facilities and a dining area. Some villas also have a private pool or hot tub. The resort recently unveiled two new treehouse villas. These Ylang Ylang Villas have expansive deck space with private pools and lounge areas. At Secret Bay you will find tropical gardens and a terrace. The tour desk can provide information about activities, including, diving and snorkeling. Private chef service is available at an extra cost. You can also find local restaurants and food markets in Portsmouth town, a five-minute drive away. Syndicate Nature Reserve and a popular scuba diving spot can also be found within a 15-minute drive of Secret Bay. Fly into Douglas-Charles Airport (DOM), formerly known as Melville Hall. Secret Bay is located about an hour from the airport. Visit Secret Bay’s website for more information.